These days, you don’t have to search far to find the latest news story of a corporate data breach. It’s a nightmare scenario, yet people still go about their day with an “it can’t happen to me attitude.” More and more companies are moving to cloud-based platforms, which provide convenience and easy collaboration, but moving to the cloud can also raise a variety of new data security questions. At SKYSITE, we take protecting your information seriously, and for the past year, we have been working hard to prove it. 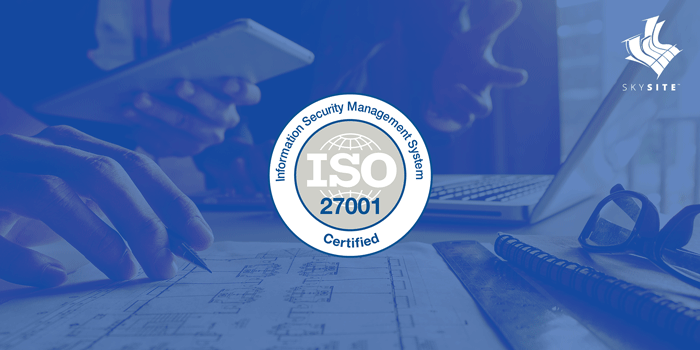 This May, SKYSITE met the requirements of ISO 27001 and joined an elite group of international companies that have been certified under this standard. The certification shows that we have been assessed and demonstrated all the requirements of a sound information security management system (ISMS). This means that SKYSITE follows recognized guidelines and best-practices for the management and security of the data you entrust to us, and that a certifying authority has validated our procedures. Bottom line; we keep your critical information and assets safe. More than simply requiring 2-step verification or other password protections, an ISMS is a systematic approach of applying risk management processes to manage sensitive company information so that it remains secure. Importantly, it extends past just online security and includes people, processes and IT systems. It specifies requirements for establishing, implementing, maintaining and continually improving an information security management system within the organization. For SKYSITE, this ISO 27001 certification represents an external validation of a belief we have always held. Your data is private, your data security matters, your data is yours and should be protected. For you, ISO 27001 should provide piece of mind that we take your data security seriously. For more information on our certification, you can read our corporate press release here.